This is the seventh book in the Haven Point series, I jumped in at book six with Serenity Harbor and have been bummed that I didn’t get in on the ground floor of this one. These books are SO sweet, I love how each one focuses on a new developing romance but there are appearances from previous characters in the subsequent books, that’s always so fun. I know I’ll never have time to go back and read the first five books, but I’ll definitely be following it from here on out. Julia is the town librarian and lives a fairly quiet life. She has plenty of close friends but her parents have both passed away and she’s an only child so she doesn’t have any real family left. Jamie needs a rental for a few weeks so his sister sets him up in Julia’s apartment that is attached to her own house. It’s a total opposites attract saturation, he’s a bit of a ladies man with a huge family, (he has six siblings) and she’s more reserved but besides the obvious cliche there isn’t anything cheesy here. I loved both of them and watching them fall in love was adorable. Jamie was quite the charmer and Julia was beyond cute but they both had wounds that needed to heal and darkness in their pasts. As much as I enjoyed their storyline two little boys stole the show and my heart. Clint and Davy end up staying with Julia while they wait for a spot with a foster family and they were the cutest kids and such a sweet addition to this already endearing story. Hot guys and darling kids, what more could a girl want?! This was a cozy little read, tons of Christmas magic set in an idyllic, charming town. 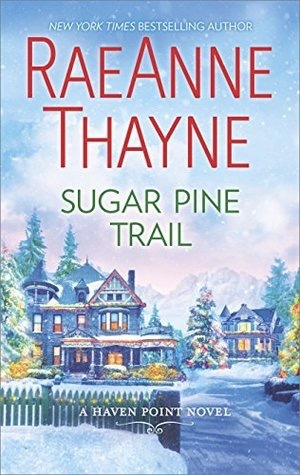 There’s a strong message of hope in Thayne’s novels that’s truly heartwarming, I’m in love with her writing style, there’s a natural ease and fluidity that just makes reading her books so much fun. If you need a book to add to your holiday reading list that would be perfect to read fireside make sure you add this one! Thanks to Claire at Little Bird Publicity for my review copy. Haha I know it’s a bit early but I’m so excited already!